After her marriage, Catherine Spencer was styled as Countess of Northumberland before 1502. Her married name became Percy. Sir Robert Spencer married Lady Eleanor Beaufort, daughter of Edmund Beaufort, 1st Duke of Somerset and Lady Eleanor Beauchamp, circa 1470.1 He died after 13 March 1492. [S11] Alison Weir, Britain's Royal Families: The Complete Genealogy (London, U.K.: The Bodley Head, 1999), page 106. Hereinafter cited as Britain's Royal Families. [S6] G.E. Cokayne; with Vicary Gibbs, H.A. Doubleday, Geoffrey H. White, Duncan Warrand and Lord Howard de Walden, editors, The Complete Peerage of England, Scotland, Ireland, Great Britain and the United Kingdom, Extant, Extinct or Dormant, new ed., 13 volumes in 14 (1910-1959; reprint in 6 volumes, Gloucester, U.K.: Alan Sutton Publishing, 2000), volume X, page 128. Hereinafter cited as The Complete Peerage. [S22] Sir Bernard Burke, C.B. LL.D., A Genealogical History of the Dormant, Abeyant, Forfeited, and Extinct Peerages of the British Empire, new edition (1883; reprint, Baltimore, Maryland: Genealogical Publishing Company, 1978), page 424. Hereinafter cited as Burkes Extinct Peerage. When beheaded for conspiring against Queen Elizabeth (avowing the Pope's supremacy, and affirming the realm to be in a state of schism, and those obedient to Elizabeth no better than heretics), his honours would have fallen under his attainder, but for the revisionary clause in favour of his brother. After her marriage, Lady Anne Somerset was styled as Countess of Northumberland on 12 June 1558. From 12 June 1558, her married name became Percy. [S6] G.E. Cokayne; with Vicary Gibbs, H.A. Doubleday, Geoffrey H. White, Duncan Warrand and Lord Howard de Walden, editors, The Complete Peerage of England, Scotland, Ireland, Great Britain and the United Kingdom, Extant, Extinct or Dormant, new ed., 13 volumes in 14 (1910-1959; reprint in 6 volumes, Gloucester, U.K.: Alan Sutton Publishing, 2000), volume XII/2, page 851. Hereinafter cited as The Complete Peerage. [S6] Cokayne, and others, The Complete Peerage, volume XII/2, page 852. He held the office of Member of Parliament (M.P.) 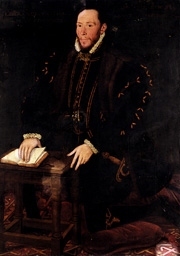 for Morpeth in 1554.1 He was appointed Knight in 1557.1 He was commissioner to treat with the Scottish Lords of the Congregation in 1559.1 He gained the rank of Captain General of the Light Horse in 1560, in an attack on the French at Leith.1 He was commissioner to negotiate with the French in 1560.1 He held the office of Captain of Tynemouth and Norham Castles between February 1560/61 and 1571.1 He held the office of Sheriff of Northumberland in 1565.1 He was commissioner to put down piracy in Northumberland in 1565.1 He held the office of Member of Parliament (M.P.) for Northumberland in 1571.1 Between 1571 and 1573 he was confined to the Tower of London on suspicion of conspiring on behalf of Mary, Queen of Scots.1 He succeeded as the 2nd Earl of Northumberland [E., 1557] on 22 August 1572.1 He succeeded as the 2nd Baron Percy [E., 1557] on 22 August 1572.1 In 1582 he was again confined to the Tower of London on suspicion of conspiring on behalf of Mary, Queen of Scots after the discovery of the Throckmorton Plot.1 From January 1583/84 to 1585 he was again confined to the Tower of London on suspicion of conspiring on behalf of Mary, Queen of Scots.1 The Earl having been committed to the Tower for participating in a supposed plot in favour of Mary, Queen of Scots, was found dead in his bed there, slain by three bullets from a pistol.